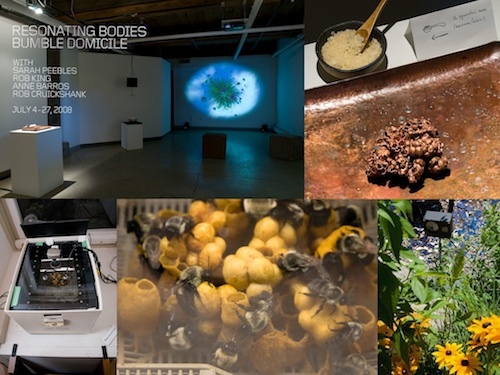 Resonating Bodies’ projects illuminate aspects of biodiversity through focusing on pollination ecology, with special attention paid to the intersection of native bees, habitat and coevolution of plants and pollinators of Canada and beyond. 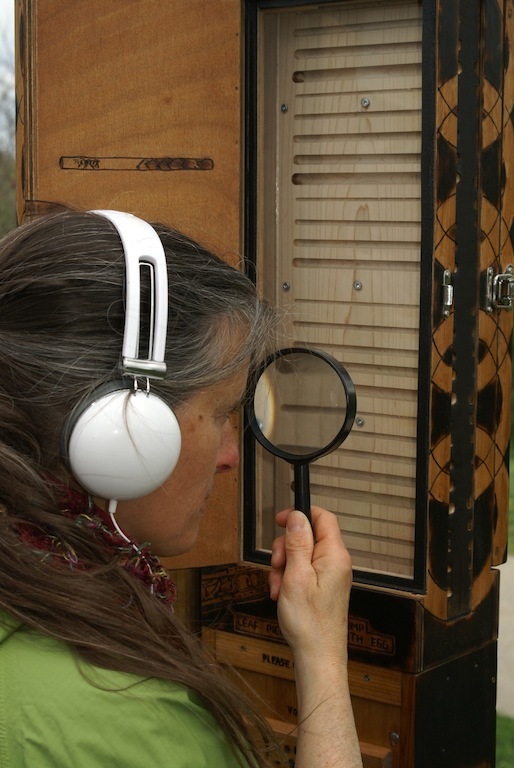 Art installations and other activities reveal aspects of local biodiversity through investigating solitary bee and wasp nesting and life cycles, bumblebee colonies and their foraging activities, ultraviolet bee vision, pollinator/plant coevolution, and colour-coded DNA barcodes (a novel technique for species identification pioneered by Canadian researchers). Resonating Bodies focuses on bees which are native to North America, and therefor does not include honey bees (genus Apis). We recommend you first check out the Bee Biodiversity page to get familiar with our native bees, many of which are solitary and don’t make honey or wax and don’t usually sting (much). Contents, listed at the right, include 4 basic sections: Bee Biodiversity, The Art (including Bee Trading Cards), Community (including comments), and Resources (including Credits). Handy tabs for the basic sections are at the top of the blog. Scroll down this page to view featured activities. Late-breaking news and more is also posted on Resonating Bodies | Facebook. 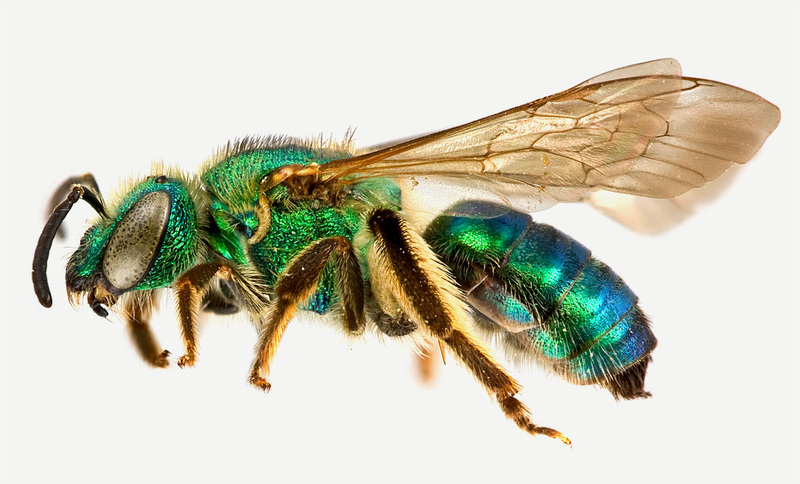 Above: Agapostemon sericeus, Female (a sweat bee), courtesy Bee Tribes of the World (bugsrus, York University); Toronto’s (un)official bee! Banner: Colour-coded DNA barcode courtesy Barcode of Life Data Systems. Photos: Observation bee colony and view of gallery installation by Dave Kemp, Bombus impatiens and flower by Amro Zayed. Pairing magnified views in tandem with amplified sound, cabinets facilitate an enhanced perception of their tiny inhabitants: solitary bees and wasps, and other nest biota in action, up close. Below: a Pugnacious leafcutter bee nests amongst others at Access Alliance. Details from this photo session are posted on Flickr here. A Habitat Wall for solitary bees and wasps, at The University of Maryland Arboretum Outreach Center (Peebles and Kuder with Raduazo). 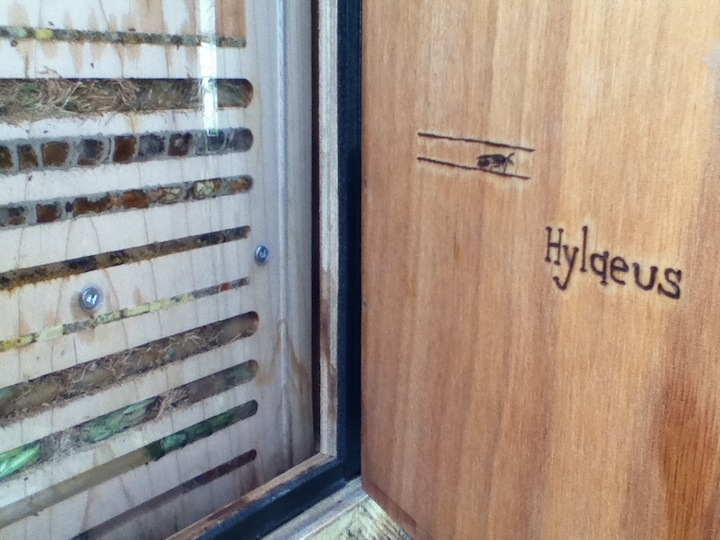 Lisa Kuder talks about the wild bees which live in Dwelling’s habitat wall and cabinet. Videos of the Audio Bee Booth Pollination Wunder Station at the Tree Museum (above) and its prototype (below) are best viewed with headphones. Created as part of the Bumble Domicile exhibit and sold through Pollinator Partnership. Wild, solitary-dwelling bees create nests, manipulate pollen and hang out in the Audio Bee Booth and other amplified habitat structures. Macro video with micro audio! 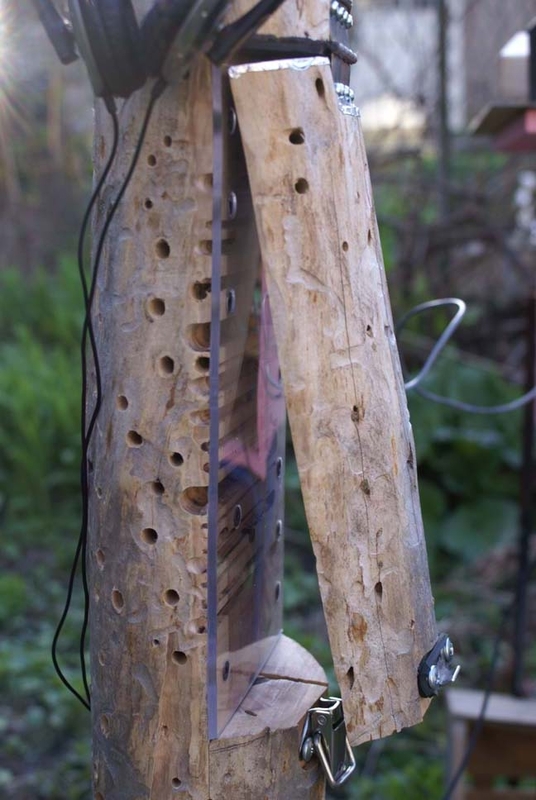 Create your own safe “bee condo” or habitat sculpture for wild solitary bees. Then, post it to our web gallery on Flickr via email – it’s easy. Bumble Domicile exhibit (2008) highlighted distinct features of bumble bees through an observation hive, garden, visual and audio transformations, scent, touch, and biological information. 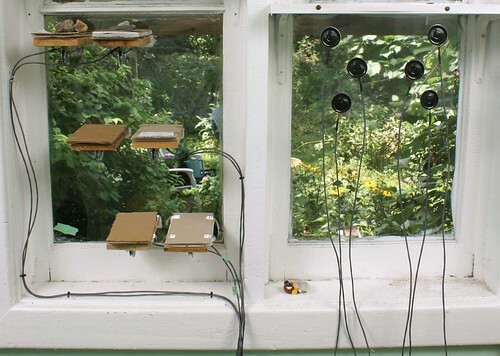 This art installation – community outreach project featured works by Sarah Peebles, Rob King, Anne Barros and Robert Cruickshank, and was created in collaboration with bee biologists and other researchers in Canada and the USA. The video “Apiograph” below describes one of the works in the exhibit: “Apiograph” – an installation visualizing the pollinating activities of the gallery’s observation bumble bee colony . The images generated in “Apiograph” were projected on the gallery wall alongside other elements of the show.